Home Trees and shrubs New South Wales and Queensland African Oil Palm Australian Fan Palm Bauhinia Coast Banksia Black Bean Curtain Fig Flamboyant Flame Of The Forrest Jacaranda Queensland Bottle Tree Queensland Kauri Rainforest tree Rattan Palm Red Cedar Saw Banksia Unknown tree I used to think this was a Banksia, but I wasn't sure. 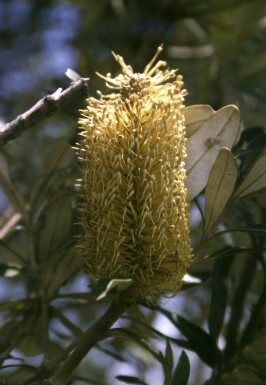 Now Adolfo Polledo gave me the hint this should be B. integrifolia, the Coast Banksia. Checking the information I agree, this should be the one. I don't remember each little detail, but blossom, foliage and environment do fit perfectly. Please tell me, if you know of a similar species! Anyway I saw many of them around the Byron Bay lighthouse, similar species about everywhere. But this is the only place I found them flowering. It was the end of october.